Russian writers and publishers were in the spotlight last week at the 40th annual London Book Fair (LBF). Russia was this year’s ‘Market Focus’ country. Events at the fair ranged from live performances, award ceremonies, language lessons and author interviews to seminars on digital publishing, genre fiction (a massive growth area in Russia) and the triumphs and challenges of translation. Theologian Andrei Kuraev even gave a lecture on ‘Harry Potter and the Russian Orthodox Church’. A day at LBF could start with a breakfast seminar on the Russian Book Market and end with vodka and surreal video-poetry. Svetlana Adjoubei, Director of Academia Rossica, who organized much of the program, sees contemporary writing from Russia as ‘a new chapter’ in the globally-celebrated tradition of Russian literature. Prize-winning novelist, Olga Slavnikova, who was at the fair, examining the current trends ‘beyond the classics’ coordinates the Debut Prize for young authors and wrote: ‘Today an unusually gifted generation is entering Russian literature. Literature has not seen such an influx of energy for a long time’. Andrei Kuzechkin and Pavel Kostin represent this new generation. Their novels have been translated into English and published together in one volume called ‘Mendeleev Rock’. As finalists for the Debut Prize, the Pokolenie Foundation has flown them over to England for LBF and they are loving it. ‘Within the first seconds in London you feel the atmosphere of freedom’ says Kostin, a 29-year-old game designer from Kaliningrad. ‘Everyone from every country can feel as though he is at home here,’ adds Kuzechkin; ‘it is like a city from the future…’ Both novels are rooted in modern culture and deal with the alienation of urban and provincial youth; both authors are interested in the impact of the internet and social media on fiction. Their editor, Natasha Perova, is excited by the growing interest abroad in Russian writing: ‘This is why I started GLAS’ (which publishes Russian fiction in English), she says, ‘to bring the mountain to Mohammed’. Publishers and authors are not the only people excited by the opportunities this year’s market focus presents. President Dmitry Medvedev’s administrative chief, Sergei Naryshkin, attended the official opening of the London Book Fair’s ‘Russian Pavilion’ on the morning of Monday, April 11th. Naryshkin stressed the fair’s importance in helping to strengthen cultural and business links between Russia and Britain and ‘overcome stereotypes’. He hoped that the ‘intense program’ in and surrounding the Fair would continue the ‘tradition of face-to-face dialogue between our citizens’ and ‘help the British widen their concept of what Russia is like today’. Tuesday was the busiest day of the book fair with a series of events entitled ‘Hot off the shelf’ aimed at highlighting growth areas in contemporary Russian publishing: detective fiction, historical novels, biopics, thrillers, science fiction and fantasy. Science was a keynote of the day, which was the 50th anniversary of Yuri Gagarin’s first human space flight. 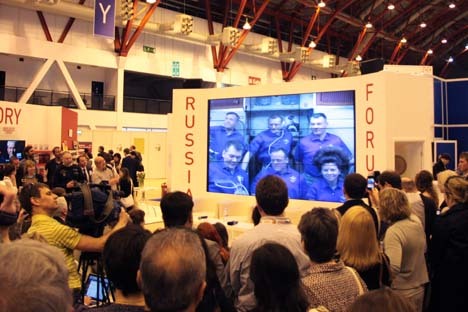 The Russian Pavilion celebrated with a video link to Russian cosmonauts talking about literature in space. There was also an interesting emphasis on the variety of perspectives in contemporary writing: the impact of emigration, immigration, exile, cultural interchange and the internet. Alisa Ganieva, who won the Debut prize with her novel 'Salam, Dalgat', comes from Dagestan and talks about the tensions for young Dagestanis between west and east: ‘they go to clubs, they take drugs, but they are also trying to be good muslims’, she says, but adds that ‘Islamic garments are currently more about fashion than faith’. She writes under a male pseudonym, Gulla Khirachev. Like Charlotte Bronte or George Eliot, this decision is partly a response to ‘the male-dominated nature of society in my republic’. Shishkin may live in Zurich, but he sees himself in a Russian tradition, which is ‘very important for me’: ‘in the western tradition, writing is just a job – people write to make money… in the Russian tradition, writers were either dependent on the government or they wrote underground, forbidden words… but they were not so dependent on readers and publishers.’ He also sees the battle with official language as something peculiarly Russian: ‘In Russia, words do not mean what they must mean… what we have today is the same Soviet Union with different words’. His latest novel, Pismovnik (‘Novel in Letters’), has yet to be translated into English. Most authors, publishers and visitors found much to celebrate in the fusion of literary traditions at LBF. The ceremonial handing over of the ‘market focus’ involved presenting Steven Rosato, director of BookExpo America, with volumes of Tolstoy, Chekhov and Pushkin. Alistair Burtenshaw, LBF’s director, commented in summing up on the ‘great many discussions and exchanges of ideas’ and ‘the wonderful vibrancy of the Russian presence’, calling it ‘the most dynamic, the most energetic market focus yet’.